DeFur Voran LLP received the 2017 Award from Construction Lawyers Society of America for its excellence in construction law. 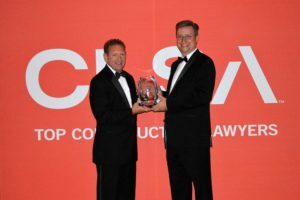 The firm was awarded for its knowledge, experience, and reputation of the firm’s Construction Practice Group and the entire firm. Awards are based upon independent research by the society and input of CLSA Fellows who sit on the CLSA Law Firm Awards Committee. Committee members vote only in construction law and they are familiar with the expertise, reputation and standing of firms in the construction law arena and consider the relative strengths to be recognized accordingly. Rob Daniels from DeFur Voran’s Fishers office is shown accepting the award. 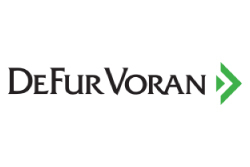 DeFur Voran has several attorneys who handle Construction Law for the firm, including Robert S. Daniels, Robert D. Emmerson, John M. Stuckey, Nicholas C. Nizamoff, Daniel G. Kerns, and Chase M. Patterson.